Warm and cozy, just what I had in mind – REintroducing Anne, a sweater vest with deep pockets, and stripes – this time worked top down, and in the round! 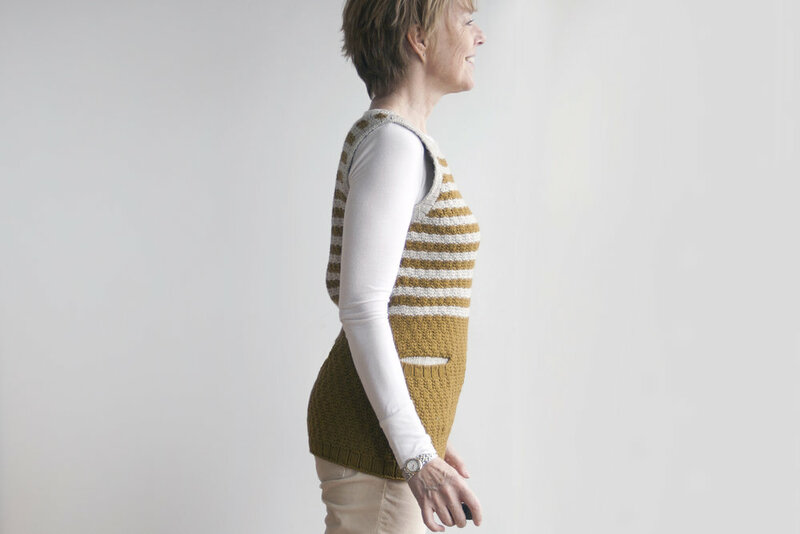 This is a shapely vest worked in Seeded Rib Check stitch pattern on worsted weight wool. The neckline sits just low enough to allow a peek of tee shirt from underneath. It’s a quick knit you’ll surely enjoy. Main color (MC) – Honey #123; 5, 5, 6, 6, 7, 7, 8 skeins, or for comparable yarn, approx 570, 650, 725, 800, 875, 950, 1025 yds / 522, 595, 663, 732, 800, 869, 938 m.
Contrast color (CC) – Audouin #157; 3, 3, 3, 4, 4, 4, 4 skeins, or for comparable yarn, approx 325, 360, 395, 430, 460, 495, 520 yds / 298, 330, 362, 394, 421, 453, 476 m.
Long-tail cast on, Cable cast on, circular knitting, decreases (ssk, k2tog, p2tog, p2tog tbl), increases (m1L, m1R), stitch pick up around neckline and armholes, short row shaping at shoulders, and blocking. 14 page pdf includes pattern instructions, photographs, schematics, stitch descriptions and charts, helpful links to online tutorials, definitions for relevant abbreviations, and Row Tracking Grids for mapping row by row progress.